Not every function is defined at every value of x. Rational functions, for example, are undefined if the denominator of the function is 0. You can use a limit (which, if it exists, represents a value that the function tends to approach as the independent variable approaches a given number) to look at a function to see what it would do if it could. You can look at the values of f(x) at x = 2, x = 2.9, x = 2.99, x = 2.999, and so on. Then you can look at the values of f(x) again from the other side: x = 4, x = 3.1, x = 3.01, and so on. All these values of f(x) are defined, except for x = 3. 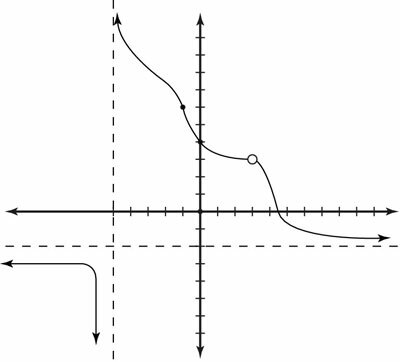 A left limit of (x) is the value that f(x) is approaching when x approaches n from values less than c (from the left-hand side of the graph). A right limit of f(x) is the exact opposite; it is the value that f(x) is approaching when x approaches c from values greater than c (from the right-hand side of the graph). If, and only if, the left-hand limit equals the right-hand limit can you say that the function has a limit for that particular value of c.
and f(x) = 1 for x > 0. If you draw this function, you see a unit step jump at x = 0.